For those with pets here at The Villages of Banyan Grove, take a look at these easy and affordable apartment hacks to keep your place in tact! Pet hair can be a huge problem, from covering furniture and clothing, to forming huge clumps on carpets. In many cases lint rollers and vacuums just don’t do the job, so here’s a new approach with something you probably already have at home! You first need to take a pair of rubber gloves and lightly damp them. Then, simply run your hands over the piece of furniture covered in hair. This tactic works great for that stubborn pet hair you just can’t seem to get off! As well, for any room with carpeting, try out a squeegee (just like the one you use to clean your car) to easily gather and remove the hair! Gone all day at work? Here’s how to keep your dog occupied to avoid him destroying the place. An easy DIY hack is to cut a two-inch slice into a tennis ball and then fill it with little treats, along with little pieces of fabric. This simple trick will keep your dog entertained for hours as he tries to get those treats out! Another similar idea, especially in the summer, is to fill up a Kong dog-toy with peanut butter and to freeze it for a couple of hours. This trick will also keep your dog out of trouble while you are gone! There are also some additional tricks that will keep your dog or cat out of trouble. For cats, they will avoid any surface that smells of citrus, so spraying any surface with a citrus-scented cleaner will keep them off. For dogs, they will avoid anything rubbed with bitter apple spray, which you can buy at any local pet store! Own a cat? 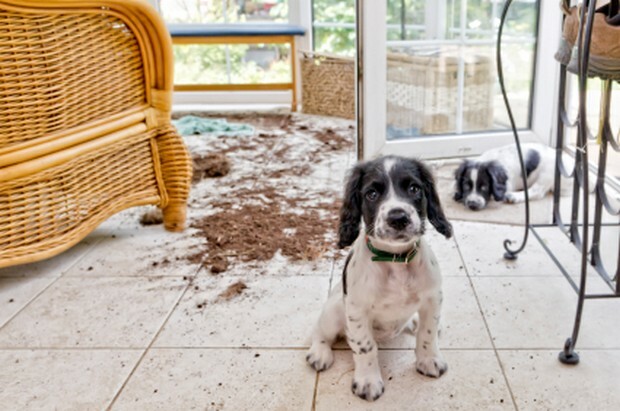 Then you know what a mess their litter boxes can leave, so here’s a few hacks for you! If you simply do not want your litter box to be seen by company, be sure to check out Ikea for some great furniture options designed for hiding them. However, if you’re looking for a more affordable solution than here’s an easy hack. Place your cat’s litter box under a side table and attach some curtains along the edges of the table. This simple trick will not just hide the messy litter box, but it's also a great way to add some color/design to complement the style of your room! How annoying are those giant paper bags that your dog or cat’s dry food comes in? Not to mention how bulky they are, which makes storage a nightmare in a tight space. One simple hack is to purchase some cheap and durable plastic cereal containers. Using these as an alternative to keep dry food makes storage simple, as well as making it very easy to pour right into your pet’s food bowl! Another possibility is to use a sealed plastic trash can, which you can store in either a kitchen closet or cabinet. These make scooping pet food a breeze, and also keep dry food super fresh!